The story starts about the summer of 1958. Friars Cliff Motors run by John Macklin, which also incorporated Friars Cliff Marine, merged with Poole Powerboats, which then became Sunseekers. A little acorn sown in Mudeford. John Macklin’s mother, who lived in Mudeford Lane, decided to open a coffee bar next to the garage. Mrs Macklin encouraged the youngsters to use her coffee bar and genuinely welcomed them but not for a great profit as in those days the youth did not have much spare money. It was a good social meeting place and somewhere different to go other than the Christchurch Youth Club in the Pit Site, which is a long way from Mudeford! As the youth did not have a lot of money and like their compatriots today went down to Avon Beach and played music on a portable record player and not surprisingly got complains from the old fogies. As the evenings drew they reverted back to Mrs Macklin’s Café and wondered what they could do and where they could go to play their music. They knew that the Bure Homage Country Club was not used very much so it was decided that Mrs Clark, who owned the Club, should be approached with a proposition that a record club be started. Mrs Clark was quite enthusiastic and agreed, so that was the beginning of the Bure Club. As the club ran successfully as a record club it was decided to hire a live band and the two snooker tables were moved to make room for the dance floor. The first live band to play was Johnny King and the Raiders, they played every Friday and we charged a two shilling entrance fee. Red Barrel and John Barleycorn were on tap at 2/6d a pint and if you were courting and wanted to be a little quieter you could go into the Glue Pot – a little bar at the opposite end to the dance floor. With the success the Bure Club progressed to live music on Saturday nights as well. The first band to play on a Saturday was called ‘The Kapota‘, one member of that band, a local lad called Andy Summers, went on to become an international guitarist as a member of ‘The Police’. 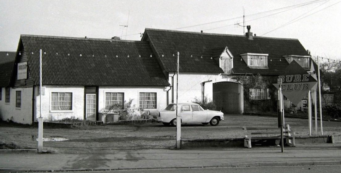 Like all good things, the Bure Homage Country Club finally came to an end when it closed for redevelopment, eventually becoming the Sandpiper Pub is now in Bure Lane. In its time as the Bure Club it provided a lot of happy times for many local lads and lassies, many of whom married their dance partners. The Bure Club certainly came a long way from its beginnings as a record club.